We updated this post to reflect the latest changes and additions to sources in early May 2017, so it’s still up-to-date! We’ve all been there: You just finished your app, uploaded it to iTunes Connect, maybe even got it through review. Now comes the moment of truth: will people actually download your app? It’s not a secret that the App Store is a crowded place. There’re more than 2.2 million apps on the App Store and there’re added more than 1000 new apps per day. A big part of your launch strategy/marketing plan should be App Store Optimisation (ASO), as it will have a direct impact on your app’s ranking and visibility in search (mainly through keywords and app title). But ASO also tackles the conversion rate mainly with the app preview/trailer, screenshots, and description, but also the “management” of ratings and reviews. That’s especially the part where Apple’s App Analytics can help you tremendously, because it sheds some light on previously “unknown” territory. In this introduction we’ll have a look on what App Analytics actually is, why you should use it and how you can get the most value out of it. 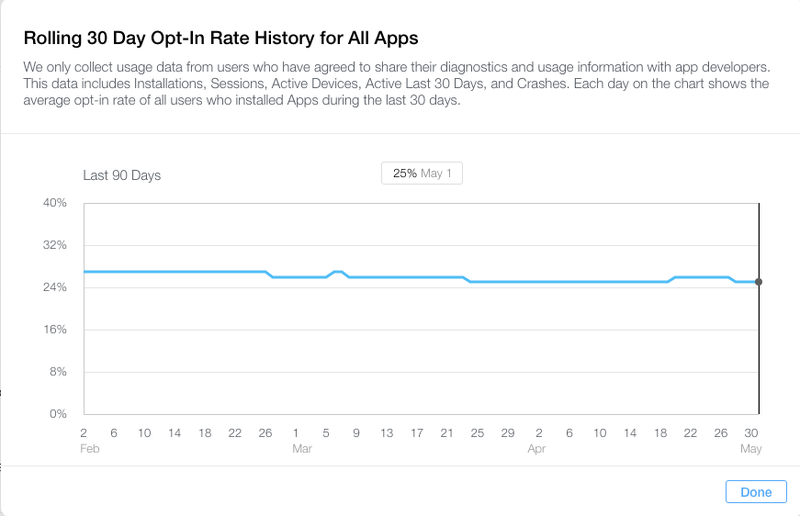 Just recently Apple started sharing aggregated and averaged data on the Opt-In rate, which can be seen on the screenshot below. As you can see it’s consistently hovering around 25%. After more than one year of comparing the data across various apps, we’ve seen this rate being consistently around 30%. Help you to track app and website referrals to measure the impact of an advertising campaign or custom marketing material. If you are familiar with the iTunes Affiliate program (you should!) and how links are constructed, it’s pretty similar. 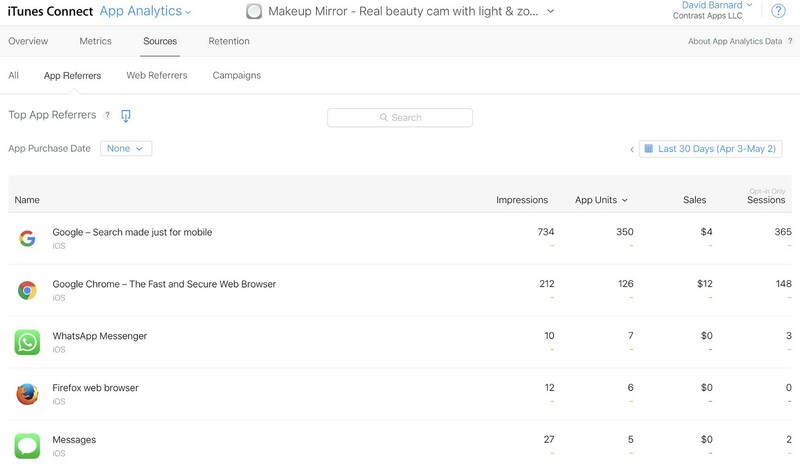 You basically have to add two tokens to any App Store link to see results in App Analytics. 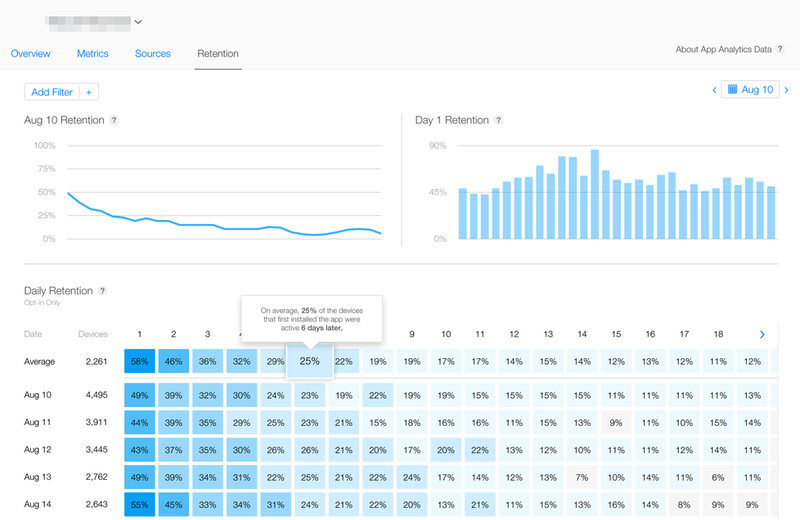 Some people might say that Retention is the weakest part of App Analytics as it’s based only on “opt-in” data. This data might not represent the actual usage behaviour of all of your users and it’s not possible to get any app-specific data like events. If you want to better understand your users and how the interact with your app, you should definitely get some event-based tracking integrated into your app. With the recent updates, you’re now able to better understand if people “reached” your store page while casually browsing the store or actively searching for it or even coming from apps or websites. Even though App Analytics provides us with a plethora of data, getting meaningful insights out of them isn’t obvious. A good starting point is your app’s conversion rate, i.e. what percentage of people, who visit the app store page, actually download your app. To get the conversion rate, you have to compare your “App Units” to the “App Store Views”. Paid apps will usually get something between 1% and 5%, whereas free apps can get rates up to 80%. 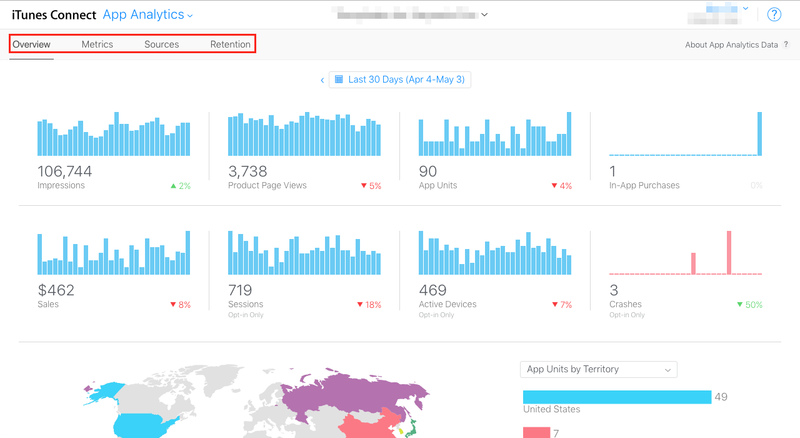 By monitoring your App Store Views closely, you can learn a great deal about ASO and what worked and what didn’t work. Now you can see directly, if changing your app name or adding keywords has any significant impact on your app’s visibility. You can also better understand seasonal trends and update cycles. The screenshot below shows the impact of updating an app, which almost doubled the App Store Views. The provider token “pt=123456” will always stay the same, just make sure to use unique and self-explanatory campaign tokens like “ct=Landing-Page” or “ct=”Twitter-Ads” to identify your different campaigns. 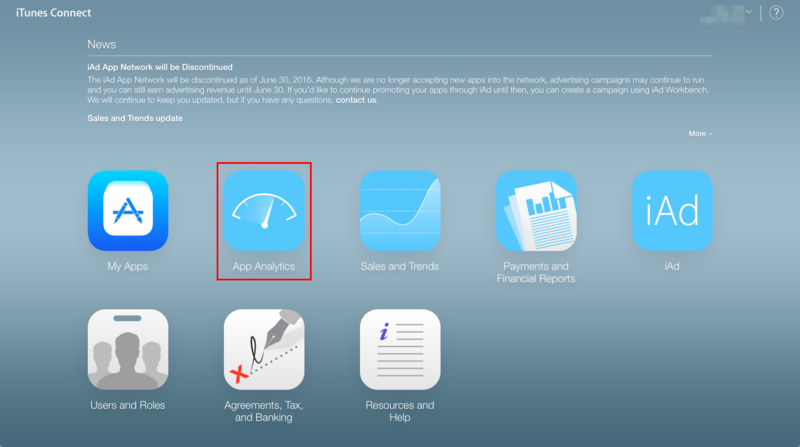 Head directly over to https://itunesconnect.apple.com and have a look at your latest app’s stats in App Analytics. Get a better understanding of your conversion rate by plotting App Units vs. App Store Views.